It doesn’t take a farm to have the heart of a farmer. Now, as a result of a burgeoning sustainable-living movement, you do not need to own acreage to satisfy your dream of raising your personal food. Hobby Farms Urban Farming, from Hobby Farm Press and the similar individuals who bring you Hobby Farms and Hobby Farm Home magazine, will walk each city and suburban dweller down the path of self sustainability. 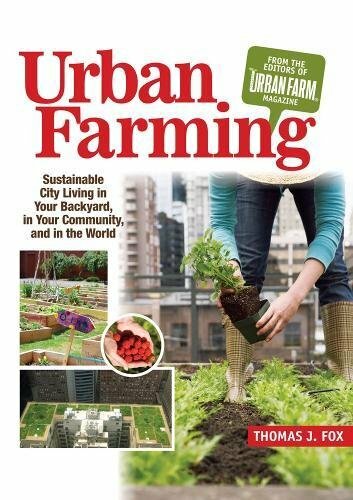 Urban Farming will introduce readers to the concepts of gardening and farming from a high-upward push apartment, participating in a community garden, vertical farming, and converting terraces and other small city spaces into fruitful, vegetableful real estate. This comprehensive volume will answer each up and coming urban farmer’s questions about how, what, where and why–a new green book for the dedicated citizen in quest of to scale back his carbon footprint and grocery bill. Winner of the 2012 Benjamin Franklin Award in Home & Garden from the Independent Book Publishers Association (IBPA).